TFI Envision, Inc. is a Leader Award Winner in the 2017 Summit Emerging Media Award competition for Standard® Diesel “Owns The Road” Print/Digital Ad Campaign. 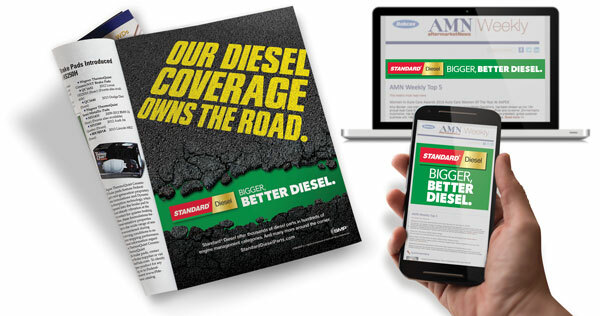 TFI Envision created a powerful ad campaign to position the Standard Diesel brand as the ‘go to’ line of diesel auto parts with an extensive line of unique products in many diesel categories. To define their place in the category, TFI Envision developed the “Owning the Road” concept. The campaign included both print and digital (animated and static). The animated digital ads visualized the toughness of the brand by having the graphics ‘shutter’ as though they were stamped firmly into the “road” background. The result: Increased awareness and sales for the brand.